The nation of Karrnath became infamous for its use of undead during the Last War. Initially, the bulk of the undead forces were common, mindless skeletons and zombies. But as the war progressed, the science of necromancy continued to evolve. The greatest breakthrough came when the high priest Malevenor and master necromancer Gyrnar Shult developed the Odakyr Rites: Techniques that could imbue the skeleton or corpse of an elite Karrnathi warrior with malign intelligence and increased resilience. The Karrnathi undead possess deadly skill and considerable cunning; once given direction, a unit of Karrnathi undead can operate autonomously, adapting to deal with unexpected threats or strategic setbacks. Most of the Karrnathi undead were retired after the Treaty of Thronehold, sealed away in vast vaults beneath Atur or stationed at Fort Bones and Fort Zombie. But a few remain in service. Recently people have reached out to me with a number of questions related to Karrnathi undead. What is the intelligence level of Karrnathi Undead? 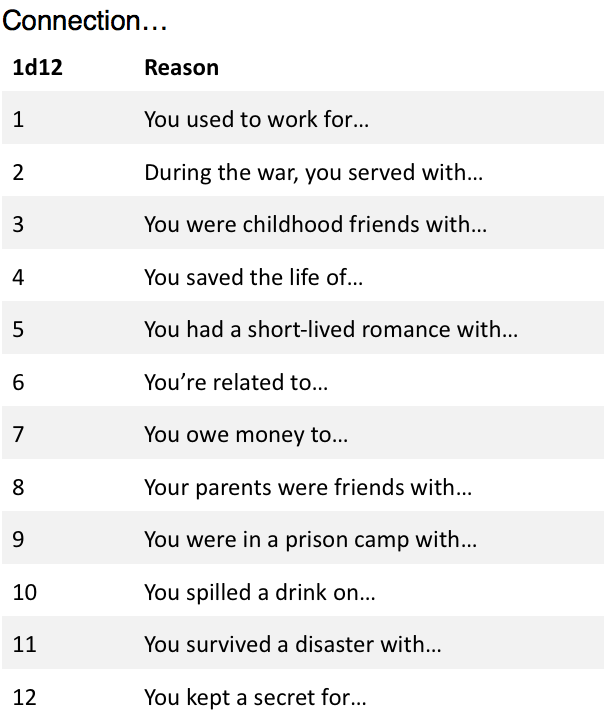 Do they have any memories of their past lives? Do they have thoughts and opinions? Would a Karrnathi Undead be a viable player character? Do the families of Karrnathi Undead get visiting hours to pay their respects to their dead relatives? As always, the real answer here is what’s going to make the best story? But let’s start with the canon presentation and move on from there. To begin with, consider the following facts about Karrnathi undead from the 3.5 Eberron Campaign Guide. Karrnathi undead are described as being “imbued with malign intelligence.” They possess 11 Intelligence, 10 Wisdom, and can speak Common. Karrnathi undead have an alignment of Always lawful evil. Sentient creatures rarely have an always alignment; certainly, the elite soldiers of Karrnath aren’t always lawful evil. So already this tells us that the consciousness isn’t the consciousness of the deceased donor of the corpse. A dictated alignment is typically tied to a creature that embodies an idea, such as a celestial or fiend; or a creature whose behavior is dictated by a supernatural force, like a lycanthrope. This ties to the fact that the undead is imbued with “malign” intelligence. Karrnathi undead possess remarkable skills. But in the ECS listing, they have no advancement. One of the defining features of the warforged is that they can learn new things: a warforged built to be a fighter can become a wizard. Karrnathi undead have tactical intelligence, but they can’t evolve. With these things in mind, consider this description of Karrnathi undead from the article on Fort Bones in Dungeon 195. The Karrnathi undead are tremendously efficient solders. A normal zombie requires some sort of necromancer to sustain and command it, but the sentient Karrnathi undead can integrate with any unit. Fear, hunger, and exhaustion are alien to them. They can see in perfect darkness—an advantage over the warforged, and one that Karrnath often exploited in conflicts with Cyre. One of the few limitations of the undead derives from their utter lack of mercy or compassion. Left on its own, a Karrnathi skeleton will slaughter all opposing forces—soldiers, civilians, even children. A commander must exercise close control if he wants his undead to leave anyone alive. The Odakyr Rites—the ritual used to create the Karrnathi undead—isn’t a cheap form of Raise Dead. The original victim is gone. A Karrnathi skeleton doesn’t have the specific memories of the warrior who donated his bones. The military specialty of the undead reflects that of the fallen soldier, so only the bones of a bowman can produce a skeletal archer. However, the precise techniques of the skeleton aren’t those of the living soldiers. Rekkenmark doesn’t teach the bone dance or the twin scimitar style common to the skeletal swordsmen. So where, then, do these styles come from? Gyrnar Shult believed that the Karrnathi undead were animated by the martial spirit of Karrnath itself. This is why they can be produced only from the corpses of elite Karrnathi soldiers: an enemy corpse lacks the connection to Karrnath, while a fallen farmer has no bond to war. However, the current commander of the Corpse Collectors fears that the undead aren’t animated by the soul of Karrnath, but rather by an aspect of Mabar itself—that the combat styles of the undead might be those of the dark angels of Mabar. Over the years, he has felt a certain malevolence in his skeletal creations that he can’t explain, not to mention their love of slaughter. He has also considered the possibility that they are touched by the spirits of the Qabalrin ancestors of Erandis Vol. The Kind hasn’t found any proof for these theories, but they haunt his dreams. Karrnathi undead never show emotion and never speak without cause. A Karrnathi skeleton is content to stand motionless and silent for days if there is no reason to move. A soldier’s name is typically a combination of name and number and the records of the original identity of the body are hidden in the tomes of the Corpse Collectors. The distinctive armor of the Karrnathi skeletons is forged for them and fitted to their fleshless bones. Fort Bones operates a small forge for this purpose, though most of this armor is created at the Night Forge of Atur. 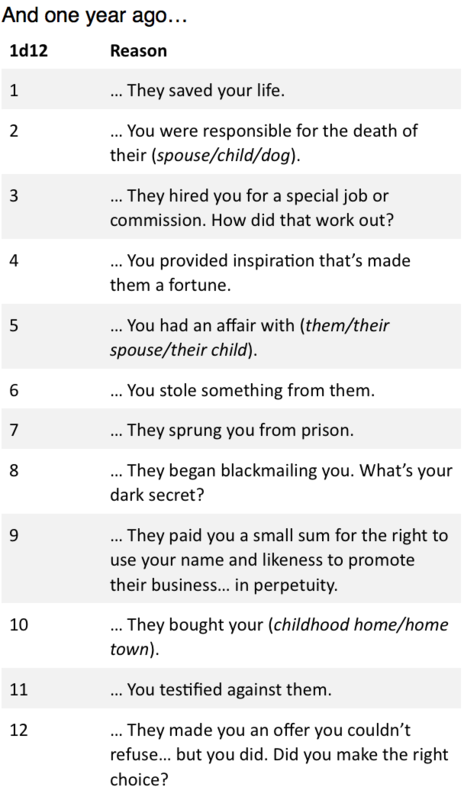 So with all this in mind, let’s look back at those questions. A Karrnathi skeleton is as intelligent as a typical human, but it doesn’t have a human personality or think like a human does. Do Karrnathi undead have thoughts and opinions? Well, how would you know? A Karrnathi skeleton obeys the orders of its commander without question. It fights without fear and will hold a position even at the cost of its own existence. The Karrnathi undead never speak unless spoken to, or unless necessary in pursuit of their duties; if they have thoughts, they don’t share them. If questions, their opinions appear to be an absolute commitment to the Karrnathi cause, and the opinions of one are shared by all of them; so they do have opinions, but they all have the SAME opinions. A warforged might compose a poem. A Karrnathi skeleton might know a poem, but if it does, then all Karrnathi skeletons know that poem, even though no one ever taught it to them. And what about that underlying cruelty, that always lawful evil? In my opinion, even a Karrnathi commander has to worry that maybe the dead are just going along with them… that maybe there’s a darker force behind those eyeless sockets, waiting for the right moment to turn its blades on you. Regarding memories of past lives: by canon, no, Karrnathi undead have no memories of their past lives. While they can only be created from the corpses of elite Karrnathi soldiers, theit skills and techniques don’t match those of the donor. They are always lawful evil, regardless of the alignment of the donor. In my opinion, the Karrnathi undead don’t even know the names of the people who donated their bones. BUT… with that said, see the next section for other ideas. With all this in mind: Would a Karrnathi Undead be a viable player character? By canon, definitely not. They can’t learn new skills or advance. Their true opinions and thoughts are intentionally mysterious. With that said, see “Other Options” below. Ultimately, there’s a critical point here: The Karrnathi undead are supposed to creep you out. They aren’t just warforged who happen to be made out of bone. There is a sense of a malign intelligence in them… a touch of Pet Semetery, with that lingering fear that you should have let them stay dead. So, that’s the canon approach. But there’s two things to consider. First, the science of necromancy has continued to evolve. As a DM, you can introduce sentient skeletons or zombies that AREN’T produced using the Odakyr Rites. Such skeletons could possess more distinct personalities, could be capable of learning new skills, and could possess memories of their former lives. You could play around with a form of undeath that can preserve mortal soul and memory in a rotting shell. And this could work for a player character. But with that said, personally I believe the Karrnathi undead should feel creepy… and I like to play up the idea that even the Seekers don’t know exactly what they are dealing with. Mabar is the plane of entropy and loss, the darkness that eventually consumes all light. THIS is the force that’s animating the Karrnathi undead. You can TELL yourself that it’s animated by a pure spirit of Karrnathi patriotism. You can say that there’s nothing of your wife left in those bones… but then one night you might hear her voice singing a song only the two of knew as the skeleton patrols the line. You might wonder if you would find her again, if you also died on the battlefield. Or you might wonder if some piece of her is trapped in those bones, held captive by the cruel spirit and never truly able to rest. So as with anything in Eberron, do what feels right for the story. But for me, I’m always looking for a way to make the undead disturbing. Even if there’s a zombie with the perfect memories and personality of your friend, I’m going to point out that there’s maggots in their flesh and occasionally a tooth will fall out… and again, are you SURE it’s the soul of your friend in there? Does this mean that undead aren’t used for menial labor in Karrnath? There’s two issues here. The followers of the Blood of Vol—who prefer the term Seekers—are the ones who practice necromancy and embrace the undead. The Blood of Vol has had a presence in Karrnath for over a thousand years, but it has never been the faith of the majority. During the Last War, Kaius I embraced the Blood of Vol and it gained greater influence, and it was in this time that the undead were incorporated into the Karrnathi army. In more recent years, Kaius III and the Regent Moranna turned against the Blood of Vol. The chivalric orders of the Seekers were disbanded, and Kaius has used the Seekers as a scapegoat—blaming the famines and plagues that crippled Karrnath on the Seekers. The faith still has a significant presence in Karrnath, but it is neither the majority faith nor in a position of power. Karrnathi traditionalists despise the use of undead, which they see as a stain on Karrnath’s proud martial tradition; this is another reason Kaius sealed the bone legions in the vaults below Atur. He doesn’t want to throw this weapon away, but he gained political points among the established Karrnathi warlords by reducing the role of undead. 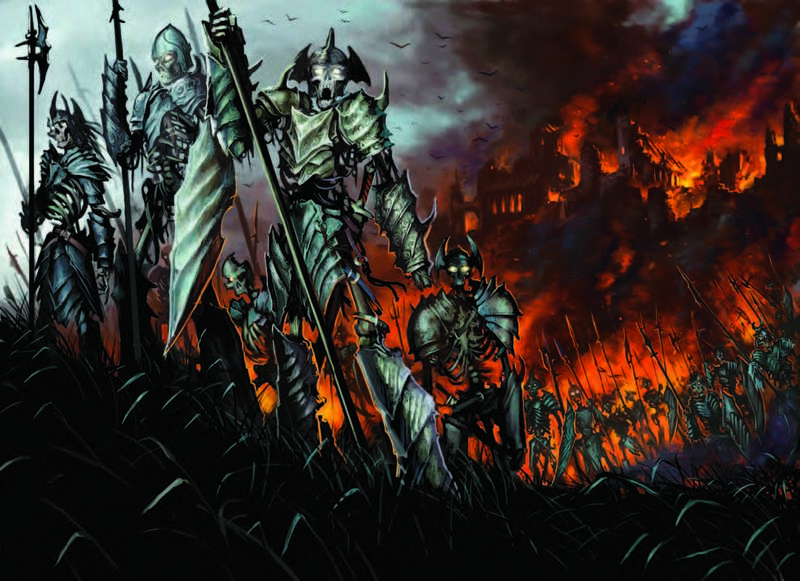 More on this—including the history of the Bone Knight—can be found in this article. Now: the Seekers have always used undead for menial tasks. They have no emotional attachment to corpses; a Seeker wants their body to be put to good use after they are gone. So within a Seeker community, you could definitely find zombies working the fields. The main point is that these are traditional mindless zombies, who have to be provided with clear direction. The sentient Karrnathi zombies are a different thing—a more recent development, and ill-suited to noncombat tasks. The Odakyr undead are weapons: sentient, yes, but imbued with malign purpose. Do the families of Karrnathi Undead get visiting hours to pay their respects to their dead relatives? By canon presentation, no. First of all, Seekers aren’t sentimental about corpses. The bones of a dead relative are no different than a set of clothes or piece of jewelry the deceased wore in life. The basic principle of the Blood of Vol is that what matters is the divine spark (what others might call the soul) and that this is obliterated in Dolurrh. A Seeker pays respects to the dead by recalling their deeds and following their example. The bones the deceased leave behind are a resource to be used, not a thing to be treasured. In addition, while the identity of the donor is noted when the Odakyr Rites are performed, this information isn’t publicly available and the undead warrior doesn’t know the name of the donor. Were the Odakyr Rites created, found, or both? What was the malign spark that granted them the sudden necromantic advance? This is covered in Dungeon 195. The Blood of Vol has always had a strong presence in the agricultural region of Odakyr, which also contains a powerful manifest zone tied to Mabar. 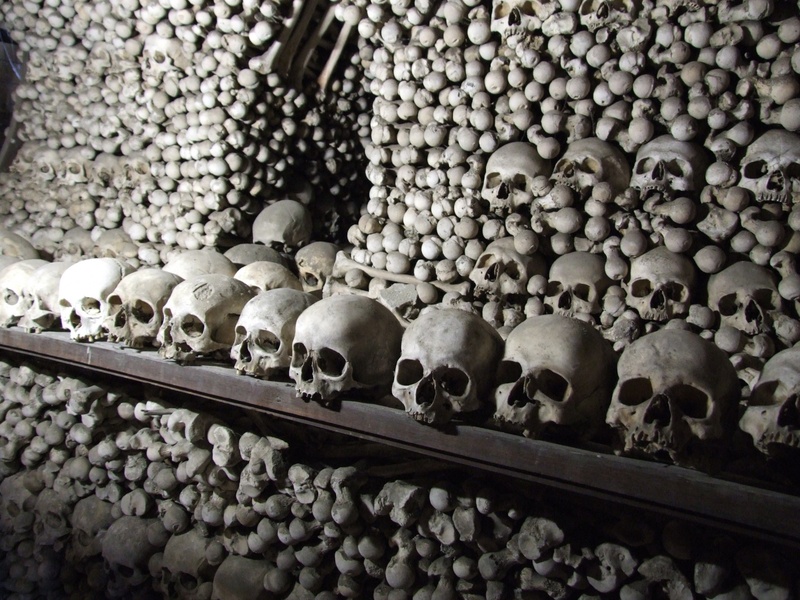 When Kaius I embraced the Last War, Fort Bones was established in Odakyr as a center for necromantic research. Gyrnar Shult and Malevenor (then living) developed the Odakyr Rites after years of research and work. It’s noteworthy that they can only be performed in a place with a strong manifest zone to Mabar; in Karrnath, this means Fort Bones or Atur. As for exactly how the breakthrough was made, it’s not defined in canon, and for me the answer would depend on how I planned to use the Karrnathi undead in the story. Did Shult and Malevenor discover some sort of artifact tied to Mabar at the heart of the manifest zone? Did they tap into the power of Katashka the Gatekeeper, or acquire some sort of ancient Qabalrin tome from Erandis Vol? Or did they just legitimately develop a new necromantic technique that no one had mastered before, which is entirely possible? Despite their cruelty, are the Karrnathi undead truly what Shult believed—empowered by the patriotic spirits of the fallen—or is there a darker secret? Were Karrnathi undead created for any other branches of the Karrnathi military? Presumably, if they are canonically inclined to slaughter, undead sailors wouldn’t be of much use, but were there undead Marines aboard Karrnathi ships in the Last War? Did Karrnath have any airships in its service with undead parachute troopers? First of all, even more so than warforged, Karrnathi undead aren’t robots. They aren’t precisely programmed; the Dungeon article notes that you can’t use the Odakyr Rites to create an undead farmer. The basic principle of the Odakyr Rites is one of sympathy: if you perform the Rites on the corpse of an expert archer you’ll be an archer, if you perform them on an elite melee fighter you’ll get a melee fighter. But even there, it’s not as if it’s a perfect proficiency match: the Karrnathi skeletons favor a two-weapon style that isn’t a standard technique for Karrnathi infantry. And again, they’re incapable of learning entirely new skills. So you could certainly have a Karrnathi galleon that has a skeleton crew manning the oars, but a) they wouldn’t be skilled sailors and given that, b) they’d likely be mundane skeletons, not sentient Karrnathi undead. However, that same galleon could certainly have a squad of undead Marines (who also have the advantage of not needing to breathe). Looking to airship paratroopers, remember that airships are a recent development—they’re only been in active use for eight years—and require Lyrandar pilots. Most air battles mentioned in canon involve aerial cavalry: Thrane wyverns, Aundairian dragonhawks. With that said, you could certainly equip undead troops with feather tokens and drop them into enemy territory; as they don’t need food or sleep, can operate tirelessly, have darkvision, and are happy to engage in suicide missions, I’m sure this was done. It seems unlikely to me, even if a GM broadens the possibilities of Karrnathi undead, that they would be created for anything other than warriors. 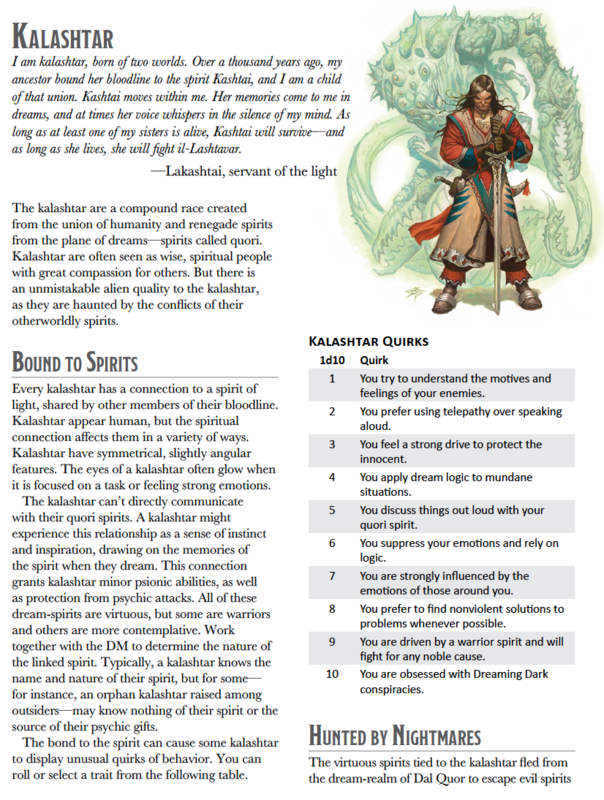 Spellcasters would require higher INT, WIS or CHA, and more independence of thought. I’m fine with the idea that there are additional forms of Karrnathi undead we haven’t seen in canon—even just skeletons and zombies with different skill sets. It could even be that a spellcaster produced using the Odakyr Rites is a more wraithlike entity. But remember that the core principle of the Odakyr Rites is sympathy: to raise a spellcaster, you’d need the corpse of a dedicated Karrnathi spellcaster. Assuming this is possible, every spellcaster raised by the Rites would have the same spell set, which wouldn’t have anything to do with the spells possessed by the donor corpse, and they couldn’t learn new ones. Given the tie to Mabar, I’d expect their spell selection to mainly be necromantic attack spells. With that said, the undead champions of the Blood of Vol have long included both mummies and vampires—so there are other options for elite undead spellcasters. Do we, or even their commanders, know how spoofable the officer recognition is on Odakyr undead is? If a Brelander wearing a Karrnathi uniform speaking with a Karrnathi accent showed at Fort Bones would the undead obey them? I see two possible approaches here. The first is to follow the point that they are sentient. Could this ruse fool a normal human soldier? If so, maybe it could fool the undead; handle it the same way, with a Deception/Insight check if you think one is called for. The second approach is to emphasize that they’re supernatural… that we don’t entirely KNOW why they follow orders. The THEORY is that they are animated by the martial spirit of Karrnath. Do you think you can fool that spirit with your crappy accent? Do you really want to take that chance? How would they react if there was a civil war and they were being used on each other? Excellent question. I think the answer is that NO ONE KNOWS. This is one reason the traditionalist warlords hate the use of undead; because they don’t know where their loyalty truly lies. They never betrayed Karrnath during the war; but what would happy if Karrns fought Karrns? Would they follow their local commanders? Would they be loyal to the crown? Would they be loyal to who THEY believe deserves the crown, and if so, does that prove the legitimacy of the candidate they support? Or could it be that once you tell them to spill Karrnathi blood… that they would turn on ALL Karrns? If the Karrnathi undead are just going along with the commands of whatever Karrnathi Commander is leading them….is it a possibility that their true loyalty is to Vol? It’s certainly a possibility. With that said, if that’s the case the question would be why she hasn’t already exercised that power—what is she waiting for? Thanks as always to my Patreon supporters for making this possible. My next article will delve into Cyre! I’m hard at work on many projects, but I’ve had a few questions tied to lycanthropes… and with Halloween around the corner, it seems like an appropriate topic to address! Thanks as always to my Patreon supporters for supporting the blog. I’ve been listening to the stories of the Werewolf Trials of the Middle Ages. 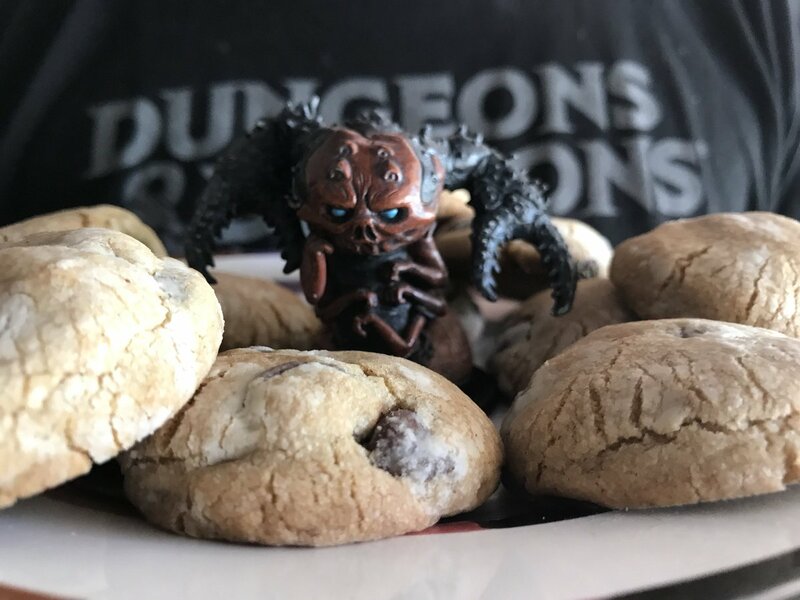 Was the Eberron purge based on these, or is this just a coincidence? 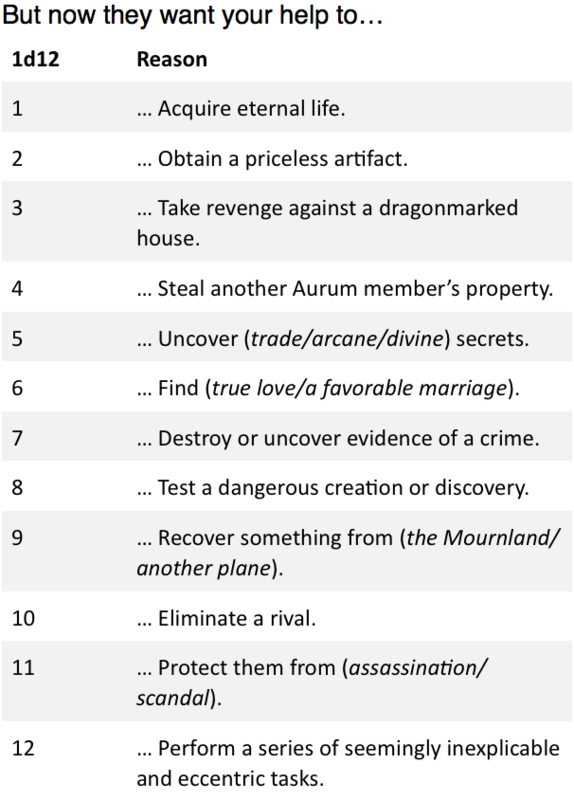 For those of you unfamiliar with the setting, the Lycanthropic Purge is an event that occurred around two centuries before the default Eberron campaign. The Church of the Silver Flame sent an army of templars into western Aundair and what is now the Eldeen Reaches to combat a rising tide of lycanthropy. Following a brutal conflict, the church supported an ongoing campaign to root out and cure or exterminate all lycanthropes that could be found. This conflict is also the root of the Pure Flame, a zealous sect of the Church of the Silver Flame that engages in ruthless and often violent behavior. People often think of the Purge as a sort of inquisition, similar to the Salem Witch Trials or the Werewolf Trials mentioned above. It certainly ENDED that way, with the newly minted zealots of the Pure Flame trying to hunt down every last lycanthrope… and in the process, targeting many shifters and other innocents. So you can certainly use werewolf trials as inspiration for this period. But that wasn’t how the Purge BEGAN; it’s how it ENDED, a cruel inquisition carried out by people who had suffered through a decade of terror and loss and who were hungry for bloody vengeance. So how did it start? Under the rules of third edition D&D—the edition that existed when Eberron was created—lycanthropy was a virulent curse. Under the rules of the time, any lycanthrope could spread lycanthropy. If one wererat creates two victims, and each of them infect two others, within five cycles of infection you have 243 wererats… and that assumes each one only has two victims! Essentially, in lycanthropy as presented you have the clear potential for a zombie apocalypse: a massive wave that could result in untold death and ultimately destroy civilization as we know it. The Purge ENDED in a cruel inquisition. But it BEGAN as a noble, selfless struggle to save the world from collapsing into primal savagery. Thousands of templars gave their lives in the Towering Woods, fighting to protect the people of Aundair from supernatural horror. Under the rules of 3.5 and 4th Edition, afflicted lycanthropes can’t spread the curse. This eliminated the threat of exponential expansion that made the Purge so necessary. Personally, I make this a part of history. At the time of the Purge, lycanthropy was more virulent. By the end of the Purge, the power of the curse had been broken. The question is: Was this tied to some specific victory, to ann Overlord being rebound or an artifact that was destroyed? Or was it simply tied to the number of lycanthropes—when the population grows, so does the power of the curse? And this is important, because in FIFTH edition, all lycanthropes can spread the curse again! Personally, I’m embracing this as the continued evolution: whatever cause the power to wane, it’s rising again. A werewolf apocalypse is a very real threat. Could another purge be called for? What Makes Lycanthropy A Curse? Lots of people like lycanthropes. They see lycanthropes as champions of nature, and as the persecuted victims of the purge. So why am I insistent about it being a curse? First, there’s a simple logic to the decision. Lycanthropes possess amazing abilities. They can transfer these gifts to others, quite easily. So if there’s no downside to being a lycanthrope, why aren’t we all lycanthropes? Why isn’t this gift embraced and shared? If one member of a party contracts lycanthropy, why shouldn’t every member of the party get in on it? With this in mind, D&D has generally inherited its view of lycanthropy from the Universal monster, not from the World of Darkness and its champions of Gaea. Even a man who’s pure of heart and says his prayers by night can become a wolf when the moon is full. It’s the vision of werewolves that chain themselves up as the moon grows close for fear of killing innocents. The third edition rules were very clear about this. Initially, when a victim falls prey to the curse, THEY BECOME AN NPC for the duration of the event and act according to their lycanthropic alignment. You lose all control and don’t know what you’ll do. Evil lycanthropes hide among normal folk, emerging in animal form at night to spread terror and bloodshed, especially under a full moon. Good lycanthropes are reclusive and uncomfortable around other civilized creatures, often living alone in wilderness areas far from villages and towns. Most lycanthropes that embrace their bestial natures succumb to bloodlust, becoming evil, opportunistic creatures that prey on the weak. The point here is simple: no player character should WANT to become a lycanthrope. It’s a terrifying burden; even good-aligned lycanthropy will destroy your original personality and turn you into someone else. Eberron generally takes a broad approach to alignment. But lycanthropy is a special case: it is a supernatural force that IMPOSES an alignment, and this overrides the victim’s ability to choose their own path. What we do say is that there are different strains of lycanthropy, and that alignment is tied to strain. So it is possible to have a good-aligned werewolf… but if they infect someone that person will become a good-aligned werewolf. Here again, I can’t emphasize enough that being a good-aligned lycanthrope isn’t just about being a virtuous person. If it was, the Silver Flame would support it. But just look back at that quote from the Monster Manual: Good lycanthropes are “reclusive and uncomfortable” around civilization. Good or evil, the curse fundamentally changes who you are and enforces a powerful set of instincts and drives. I feel that natural lycanthropes have a greater ability to adapt and evolve personalities around the behavior dictated by the curse. But it’s important to recognize that there is a fundamental difference between a natural lycanthrope and, say, a gnoll or a shifter. The lycanthrope isn’t just bestial in appearance; they are a vessel for a powerful supernatural force that shapes and drives their behavior. A natural werewolf can fight those urges, but the urges will always be there. The origins of lycanthropy are shrouded in mystery. As with the Mourning, I don’t think this is something that needs to be established in canon. I’d rather present a few different ideas, and let each DM decide which one they prefer. So consider the following. The Gift of Olarune. Common belief is that shifters are thin-blooded lycanthropes. But there are shifters who say that their kind came first. Shifters are touched by Eberron and Olarune, tied to the natural world. Olarune empowered her champions with a stronger bond to nature, blessing them with enhanced vitality, animal form, and other gifts. According to this legend, this gift was corrupted by a dark power—one of the other forces presented below. This explains why lycanthrope traits don’t reflect the natural animal. The wolf isn’t a cruel murderer; but the werewolf embodies our fears of the savage predator that lurks in the darkness. The rat doesn’t scheme to spread disease and undermine cities… but the wererat does. This means that there was a proto-lycanthropy that was entirely benevolent… and it allows players to have a quest to restore this, cleansing the curse as opposed to wiping it out. In my opinion, this “pure” lycanthropy wasn’t infectious—it would only produce natural lycanthropes, assuming it was hereditary at all. Alternately, it might not even resemble lycanthropy; these blessed champions could be a form of druid. Overlords: The Wild Heart. The novel The Queen of Stone suggests that lycanthropy is tied to one of the fiendish Overlords of the First Age, a mighty spirit known as the Wild Heart. If this is true, lycanthropy has been around since the dawn of time… and the waning and waxing of the power of the curse likely reflects the strength of the Overlord’s bonds. If you want positive lycanthropes in the world, the Wild Heart could have corrupted Olarune’s Gift… or you could reverse it and say that Olarune’s Gift is a variant that released some of those cursed by the Wild Heart. Daelkyr: Dyrrn the Corruptor. The Daelkyr are known for transforming victims and creating monsters. Not all of their creations are aberrations; the daelkyr Orlassk is credited with creating medusas and basilisks. Dyrrn the Corruptor is especially know for, well, corruption; this certainly fits with a curse that transforms people both physically and mentally and turns victims into predators that prey on their own friends and family. This could have been something created from scratch… or they could have corrupted the existing primal gift. So personally, I see even good lycanthropes as victims, and as people who don’t want to spread their curse because it WILL destroy the original personality of the victim. I have run a campaign in which a druid was working to restore the curse to its original blessed form. But looking to all of this: this is how I run lycanthropes. It’s in line with the depiction in the Monster Manual, which emphasizes lycanthropy as a curse that drives unnatural behavior (whether good or evil). I personally like the idea of the lycanthrope as an alien entity, a being whose behavior is shaped by an unknown supernatural power. Essentially, D&D has a LOT of half-animal humanoids. Tabaxi, gnolls, giff… I like to make lycanthropes feel very different than all of these. Whether in human, hybrid, or animal form, a werewolf is a magical weapon, shaped and empowered to prey on the innocent (or to defend them, if it’s a good strain). Natural lycanthropes can take control of this; Zaeurl of the the Dark Pact is a brilliant warlord. Zaeurl isn’t wild or uncontrolled, she isn’t a slave to her instincts. But she is still a vessel for a power that makes her a supernatural predator, and those murderous instincts are always there. The same is true of the good lycanthrope: they aren’t cruel or murderous, but there is a deep primal core to their personality calling them to retreat to the wilds, to defend their territory. But again: I embrace this because I LIKE it… because I LIKE lycanthropes, regardless of alignment, to feel dangerous and alien. I want my players to be terrified of contracting lycanthropy, not looking forward to it. If you want to do something different in your campaign, follow the path that’s going to make the best story for you and your players. Here’s a quick overview of the Lycanthropic Purge, pulled from one of my earlier posts. Templars were dispatched to Aundair, and fears were confirmed; there were more lycanthropes than anyone guessed, and they were better organized than had been seen in the past. What followed was a brutal guerrilla war; the templars had numbers and discipline, but they were fighting an unpredictable and extremely powerful foe that could hide in plain sight and turn an ally into an enemy with a single bite. Thousands of Aundairians and templars died in these struggles. Cunning lycanthropes intentionally sowed suspicions and fomented conflict between templars and shifters, resulting in thousands of additional innocent deaths. How prevalent were lycanthropes during the Dhakaani Empire? That depends on the origin you chose for them. If you follow the idea of an Overlord, than the curse would exist during the Empire. However, I think it would be extremely rare. Consider a) the Dhakaani are highly civilized and city based, and b) the Dhakaani were a highly regimented and ruthless culture. Essentially, I would see the Dhakaani as being VERY quick to completely cauterize any nest of lycanthropes, just as they would quickly wipe out any form of biological disease. Now, lycanthropes could have still flourished in the wilds— the Towering Woods, the Shadow Marches—but they wouldn’t be seen in the Empire. On the other hand, if lycanthropes were created by Dyrrn the Corruptor, they would have been a weapon unleashed in the Xoriat Incursion. There could well be historical evidence of a stretch of the western empire that was almost completely wiped out in a lycanthropic exponential expansion. Given this, if you wanted to present a Kech of the Heirs of Dhakaan that have somehow adapted and controlled their lycanthropy, it could be an interesting story—though the other Kech might see these things as abominations. We’ve never discussed this in canon. There’s certainly precedent for it with the Moonspeaker druid. We’ve suggested the idea that Olarune has the greatest influence over lycanthropes, but I think it would be very interesting to say that different moons drive different impulses or moods. Another option would be to tie each strain to a particular moon. I’m very curious about how lycanthrope genetics work. I know it’s a supernatural thing and probably don’t follow any scientific logic at all, but bloodlines and heritage are still strong symbolic themes to play with. It’s a good question. If a natural evil werewolf has a child with an afflicted good werebear, what’s the child? You’re correct to keep in mind that this is fundamentally magic and that science isn’t the factor here. I’m inclined to follow the precedent of the kalashtar, and to say that while the child may inherent genetic traits from both parents, they only inherent the supernatural lineage of one of them. In the example above, they don’t produce some sort of neutral wolfbear; the child is either a good werebear or an evil werewolf. In the kalashtar, this is predictable and tied to gender; the child inherits the curse from the parent of the same gender. But you could just as easily make it random, or assert that one of the strains (I’d tend to say the evil one) is dominant. I will say that I don’t consider natural or afflicted to be a factor in this. Once you have the curse you have the curse. It’s more deeply rooted in the natural—it can’t be removed, and it’s shaped them psychologically since birth—but in terms of passing it to a child, I think there’s no difference. Is it correct to assume that the children of a natural or afflicted lycanthrope with a humanoid is a shifter (albeit one with far more obvious bestial traits than average)? No, that’s not what I’d say at all. In my opinion, the connection between lycanthropes and shifters is more nebulous than that—and as I suggest above, it could be that shifters actually predate lycanthropes. We’ve called out that with shifters it’s not necessarily clear what animal they are tied to, and that shifter traits aren’t hereditary. If shifters are related to lycanthropes, I think it’s the process of many generations. So personally, I would say that the child of a humanoid and lycanthrope is a going to be a natural lycanthrope. The curse isn’t natural and isn’t limited by genetics; it’s a curse. WITH THAT SAID… I can see some strong story potential to making it not an absolutely sure thing, which would allow you to have a character who appears to be normal only to develop lycanthropy spontaneously late in life (Shadow over Innsmouth style). With that said, if you want to use shifter mechanics to represent a hybrid child of a human and lycanthrope, there’s nothing wrong with that. I’d just personally say that the character isn’t a traditional shifter—that the MECHANICS are the same, but that there will be obvious physical differences (this character would be more obviously linked to the particular animal, would be driven to a specific subrace, etc). One sourcebook (was it Secrets of Sarlona?) mentioned that shifters and lycanthropes originated from Sarlona, more specifically from the Tashana Tundra. If so, shouldn’t the daelkyr hypothesis be ruled out? 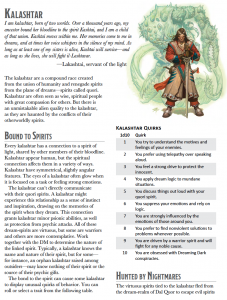 The sourcebook in question is Secrets of Sarlona. There’s a few factors to consider here. Secrets of Sarlona suggests that shifters began on Sarlona, but gives no explanation of how they came to Khorvaire. It specifically presents this Tashan origin as a surprise to both the humans and shifters of Khorvaire. Neither shifter culture seems to have the motives or resources to organize a vast migration by sea, and the Eldeen shifter culture isn’t strongly intertwined with humanity. Putting these three factors together suggests that shifters arrival in Khorvaire predates humanity, and was unusual in its origin. So I’ll present one hypothesis: Perhaps a large group of shifters entered one of the Wild Zones of Sarlona and were thrown into Thelanis. There, an Archfey—who called herself Olarune, after the moon—guided them through the Faerie Court, leading them out through another manifest zone into Khorvaire. 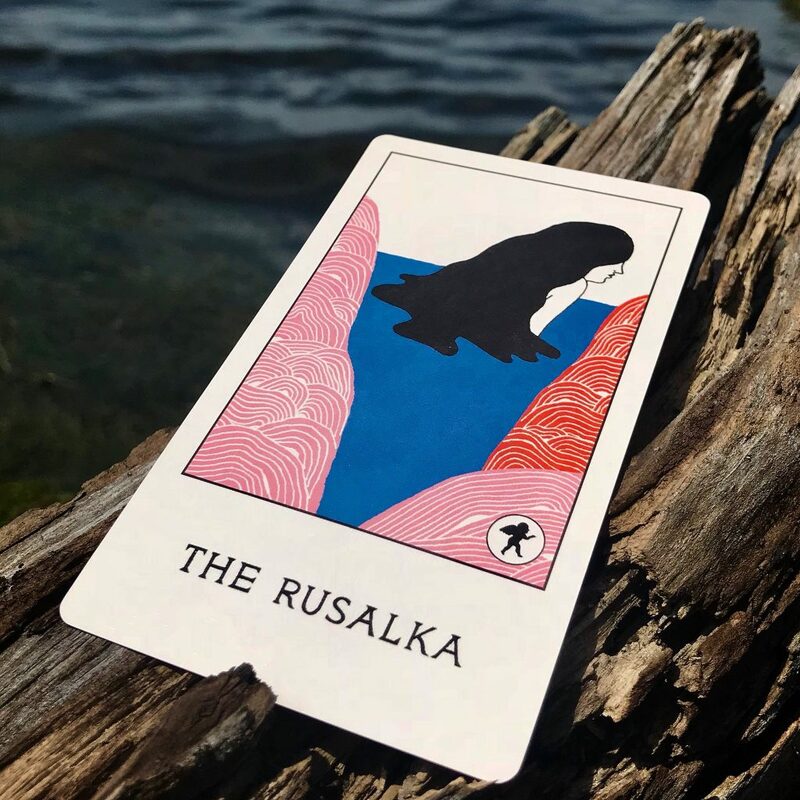 This provides the basis for folktales of shifters as the chosen people of Olarune and gives them a migration that’s entirely unconnected to humanity. This could have occurred long before humanity crossed the ocean. And if we posit the Towering Wood as their landing point, it’s a wild region that was never tamed by Dhakaan; so it’s entirely possible they could have been present during the Daelkyr conflict. WITH THAT SAID: A daelkyr wouldn’t have to cross thousands of miles to threaten Sarlona. We’ve discussed the Umbragen of Xen’drik fighting daelkyr. Remember that Khyber contains a myriad of demiplanes, which don’t follow natural law. So you could easily descend into Khyber in the Eldeen Reaches and emerge in Xen’drik, if you found the right passage. Also: Secrets of Sarlona DOESN’T provide any explanation for the origin of lycanthropy. It seems to have had no significant impact on the history of Sarlona and is barely mentioned. It presents the possibility that it’s the result of an exposure to wild zones, but this is clearly called out as simply one possibility, not concrete fact… and I find it to be a weak story compared to the other options. It’s worth exploring this a bit. The shifter tribes of the Towering Woods have far more experience with lycanthropes than humans do. They know that the good strains don’t pose a threat, and many clans would work in harmony with good-aligned lycanthropes. However, they despise EVIL lycanthropes. Again, per core rules, an evil lycanthrope is compelled to prey on the weak and innocent, even taking joy in targeting former friends and family members. The shifters understood this threat better than anyone, and had no desire to shield evil lycans. But they also understood that there were good strains as well. So in principle, shifters and templars could have worked together against the common foe. But cunning lycans (especially wererats) worked to destroy this possibility before it could be realized. These agents intentionally sowed the idea that shifters were weretouched and supported all lycanthropes, actively working to set the templars and shifters against one another. The damage done by this lingers to this day. Many shifters hate the church, and followers of the Pure Flame hold to the idea that all shifters are weretouched or lycan sympathizers. With that said, this isn’t universal. Many people on both sides understand that this was a trick, misinformation to turn allies against one another. There were shifters and templars who fought side by side during the Purge, and shifters who have become champions of the church in the decades that have followed. All of which is to say: It’s up to your players to decide where they stand on this. Either one could be blinded by superstition and prejudice. Or they could understand that this hatred was engineered by a mutual foe, and be trying to work past it. During development, was the purge specifically created to offset the “They’re heroes!” mentality that might come from such a “Holy Glorious Shenanigan” mindset otherwise? Yes and no. The Purge was inspired by historical events, certainly: crusades, the Inquisition, wiping out smallpox. But in these situations, it’s vital to remember that Eberron isn’t our world. When we think of witch trials, we inherently assume that this involves the paranoid persecution of innocents, because (we believe) witches aren’t real. By contrast, the Purge was driven by an absolute concrete apocalypse level threat. Whatever you think about lycanthropes generally—even if you believe that lycanthropy is a blessing creating champions of the natural world—the lycanthropy presented in the rules of third edition was a curse, a supernatural force that could turn the noblest soul into a cruel murderer with the power to create more murderers. The curse that set the Purge in motion was a real, concrete supernatural threat that would have collapsed human civilization into primal murderous savagery. This is why it’s logical to think that this curse was created by the daelkyr or an Overlord: because it’s a weapon perfectly designed to tear apart a civilization from within and without. So at its core, the Purge WAS a Holy Glorious Shenanigan. People ask why the Church didn’t put more effort into curing the victims, why it was so ruthless. To me, this fails to grasp the brutality of the situation. In my mind, we are talking about a horrific, terrifying struggle. Lycanthropes are powerful and deadly, and one-to-one the Templars were badly outmatched. Take the movie Aliens and set it in a redwood forest: that’s how I see the early days of the Purge. Add to this the idea that any village you find could be riddled with wererats scheming to poison you or turn you against innocents… or the entire village could BE innocent, and YOU DON’T KNOW. There could have been periods of peace, but when a surge occurred it would be sheer apocalyptic horror. In this phase, the templars weren’t cruel inquisitors. They weren’t in the position of power. They were heroes laying down their lives to protect the innocent people of Aundair. After years of conflict, the tide finally turned. The power of the curse was broken. Suddenly the numbers of lycanthropes began to dwindle as they were defeated. But as noted in my timeline, this had happened before; no one knew that this time the threat was truly over. Now that the outright war had been won, the focus shifted to rooting out the survivors… those lycanthropes still hidden among the population. THIS is where we shift to the cruel inquisition and the paranoid witch hunt, taking the story we’ve seen play out many times in our history. But it’s important to remember that you’re dealing with a population that had suffered through a generation of blood-soaked terror, people who’d had lost countless loved ones to murderous lycanthropes. And remember that WE have the benefit of a rulebook that tells us with absolute authority how lycanthropy works, how it can be cured, that a good lycanthrope only creates other good lycanthropes. They had none of these things: what they had were countless conspiracy theories and superstitions born of terror and rage. And this was the foundation of the Pure Flame: a sect who saw the Silver Flame as a weapon, a tool not simply to protect the innocent but to punish the enemy, a force that had saved them from annihilation and could now make the forces that caused such terror pay for it. So if anything, the Purge is a reflection of the moral complexity of the setting. It’s an event that can’t be painted as entirely good or purely evil. It was a conflict fought for the noblest of reasons that may have saved human civilization; and it was a ruthless persecution that resulted in the deaths of thousands of innocents and set an ember of hatred and suspicion between shifters and the church that still burns today. It is a stain upon the Church of the Silver Flame because of the innocents who died; but it’s also a symbol of selfless courage, of templars placing themselves in harms way to protect hundreds of thousands of innocent lives. That’s all for now… happy Halloween! There are a few questions I’ve been asked time and again over the years, and one of those came up again just recently: How do firearms fit into Eberron? There’s a number of different gunpowder related classes and rules out in the world; Unearthed Arcana even included a version of the artificer with a Gunsmith archetype. So, how do firearms fit into the setting? The short and simple answer is they don’t. From the very beginning, Eberron was designed as a setting where arcane magic was the foundation of civilization. The core idea is that in Eberron people wouldn’t pursue the development of firearms and gunpowder, because they have a different tool for creating explosions and hurting people at a distance… so they’d refine that magical tool instead of pursuing something entirely different. But… isn’t another core principle of Eberron If it exists in D&D, there’s a place for it in Eberron? So: there’s a gunslinger class and I’ve got a player who really wants to use it… what do I do with it? In any situation like this, the most critical question is: WHY do you want to add this thing into Eberron? What is the story you are trying to tell, and do you need to change the world to tell it? 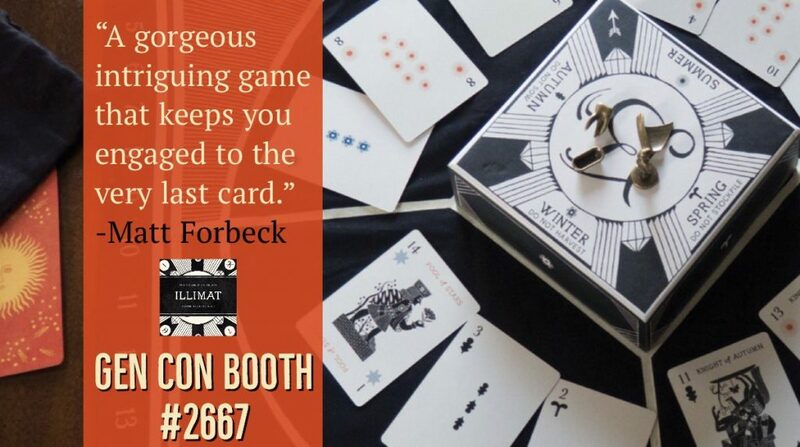 Does your story absolutely require the existence of some form of gunpowder analogue… or could you take the same basic idea and reflavor it to work using magical principles instead of gunpowder? The basic principle of Eberron is that people are finding ways to solve the problems we’ve solved with technology by using magic. Instead of using telegraphs or cell phones, they have speaking stones and sending. Thus, the idea that’s most in keeping with the setting is to develop a magical analogue to the firearm. Wands, staves, and rods are tools that can hold and channel mystical power. In third edition, it wasn’t feasible to use wands as personal sidearms; they were too expensive and also entirely disposable, and it was hard to imagine a unit of soldiers equipped with such a tool. But we took steps towards this by introducing the eternal wand, which had fewer restrictions on who could use it and which recharged every day. While statistics were never presented for it, in my novels I also presented the idea of the siege staff, Khorvaire’s answer to artillery. The idea’s simple: if a wand holds a little power and a staff can hold greater power, then a staff made from a tree trunk could hold greater power still, dramatically amplifying the range and radius of a spell effect to fill the same role as cannons in our world. The later editions of D&D have made casual combat magic easier to use. In fifth edition, a wand is an arcane focus that costs a fraction of the price of a longbow. Such a wand has no inherent power of its own; it channels the power of a spellcaster. Meanwhile, the Magic Initiate feat establishes the idea that you don’t need to be a wizard or warlock to know a cantrip or two. So in the Wayfinder’s Guide to Eberron we embrace this idea and suggest that over the course of the Last War the nations began training elite arcaneers—essentially, soldiers who gain the Magic Initiate feat and can perform simple combat magic. Because NPCs don’t need to follow exactly the same rules as player characters, I suggest that wandslingers typically only know offensive cantrips (spells that require an attack roll or saving throw), and further that the typical wandslinger needs an arcane focus to perform their magic. Essentially, for a player character a wand is an optional tool; for a wandslinger, it’s a requirement. This is intended both to emphasize that player characters are remarkable, but also to establish that in this world arcane focuses are important tools—that there’s a form of science at work here, and that the “wand technology” is significant. There’s a few issues with arcane focuses replacing firearms. One of the obvious ones is range: a fire bolt has a range of 120 feet, while a bow can hit an enemy up to 600 feet away; don’t we need a solution that can match that? There’s also the issue that only spellcasters can use the wand, so wouldn’t we have an answer that anyone can use? Addressing the second point first, we do have a solution anyone can use: a bow or crossbow. And anyone CAN learn to use a wand… if they put in the time. Again, the core idea of Eberron is that the magic used by a magewright or a wandslinger is a form of science. Different people may have a special aptitude to different types of spells, just as in our world some people have a talent for a certain type of instrument while others just aren’t very musical. But anyone CAN learn to play an instrument… and in Eberron, anyone could learn to use a wand. On the other hand, they could also put that time and energy into mastering another skill. So Aundair’s elite infantry may be made up of wandslingers, who have the equivalent of Magic Initiate; while Thrane’s elite archers have the equivalent of the Sharpshooter feat, reflecting their specialized training. So: a basic principle of Eberron’s widespread magic is that many magical tools do have a living component. A siege staff requires a trained person to operate it. And this is why crossbows and arbalests DO still have a place in the world. But remember that here too, these tools can be enhanced by magic. If an Aereni ship uses an arbalest, the bolts could easily be explosive; we’ve also mentioned livewood bolts bound to a dryad, allowing the dryad to manifest on the ship struck by the bolt. Rather than saying “An arbalest is inferior to a cannon, they’d have to have developed cannons,” consider the ways that you could magically enhance an arbalest to match the capabilities of a cannon… even if, like the livewood arbalest, the actual results are very different. Still, there’s a few valid points. Range is a significant limitation for the battlefield wandslinger. And another thing that bothers me is that in fifth edition there’s no difference between the arcane focuses. Wand, staff, orb… it’s a purely cosmetic choice with no practical effect. Given the idea that these things are tools, I wanted the choice of focus to matter. 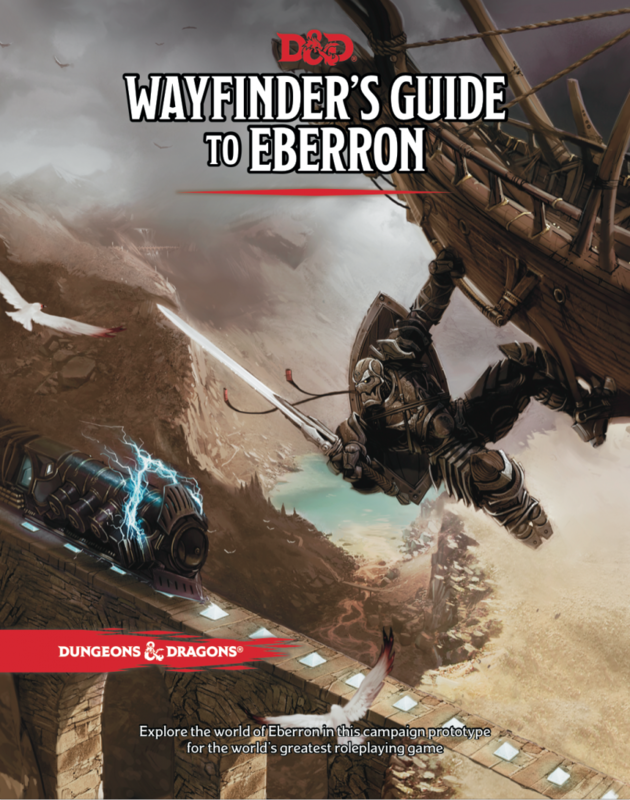 The Wayfinder’s Guide to Eberron includes one set of rules. Here’s a summary of what I’m playing with now. The staff rules are new and largely untested, which is why they aren’t in the WGtE, but you could try them out if your players and DMs agree. A wand, crystal, or orb is used in one hand. This has no inherent impact unless you’re using a special focus (imbued wood, orb of shielding, etc). A rod can be used with one or two hands. If it is used with two hands, the range of any offensive cantrip you cast is increased by 50%. Using a two handed arcane focus meets the somatic requirements of a spell. A staff requires two hands. When casting an offensive cantrip, the standard range is the listed range for the cantrip, but the staff provides a long range equal to four times the listed range: so when using a staff, fire bolt has a standard range of 120 feet and a long range of 480 feet. When casting an offensive cantrip beyond normal range, you have disadvantage on the attack roll and the target has advantage on the saving throw. Using a two handed arcane focus meets the somatic requirements of a spell. The goal here is to present the wand as a sidearm—short range, easily concealable—with the staff as the analogue to the rifle. A team of Aundairian arcaneers equipped with staves can’t quite match the range of Aundairian archers, but they can come close… and of course the staff doesn’t require ammunition and the damage scales with the user’s skill. Note that these rules specifically apply to “offensive cantrips”—cantrips requiring an attack roll or saving throw. The staff increases the range of fire bolt, but it doesn’t quadruple the range of message. The basic principle here is simple: rather than say “A cantrip is inferior to a gun, so people would develop guns,” consider how magic might evolve to fill the same niche. We need to kill someone from farther away? Let’s see if we can increase the range of the spell by making a longer wand (IE, a staff). Want a silencer? Perhaps you can buy a ring that goes around the end of a wand or staff and reduces the obvious discharge. Explore magical solutions. With that said, bear in mind that part of presenting magic as a form of science is that magic has the same limitations as science, one of which is that progress comes slowly. Within current lore the idea is that the techniques of the wandslinger only developed over the last thirty years. People are actively working to improve these things and to make better focus items. So, the first question is whether it’s possible to just reflavor whatever class or element is calling for guns to use a magical alternative. Currently I’m running a campaign in Q’barra that has the flavor of a fantasy western, and so far, I’ve been very happy with how the wandslinging rules fill the gap for firearms. The sheriff relies on sword and bow; the warlock’s a fancy wandslinger with a brace of imbued-wood wands; the innkeeper has a rod behind the bar in case of trouble. So: I would just reflavor a gunslinger class to use wands. But perhaps that doesn’t work. Maybe the mechanics don’t make sense with a wand, or maybe the DM or player really, really wants something that functions more like an actual gunpowder weapon. There’s a place for everything in Eberron; you just have to find it. If I had a player who really, really wanted to be a gunslinger, I wouldn’t solve this problem by giving firearms to House Cannith or the Five Nations. The core idea is that the Five Nations solve their problems by using arcane magic, not technology. But… what about a society that DOESN’T possess arcane magic? An advanced, militaristic civilization already renowned for its metallurgy and smithing techniques—a civilization that is thus perfecting the mundane arts of war? Those of you who know the setting well may already have guessed who I’m talking about: the goblinoid Heirs of Dhakaan. Now: I’m not suggesting that the goblins of Darguun—the Ghaal’dar—have guns. And I’m not saying that the Dhakaani had firearms when they fought the Daelkyr. The Heirs of Dhakaan have been in subterranean isolation for thousands of years, and I’m suggesting that some of their clans may have developed this technology during that time. The Kech Volaar study arcane magic, and thus they wouldn’t have firearms. The Kech Sharaat pride themselves on their mastery of melee combat. So I’d introduce the Kech Hashrach, a clan that has developed firearms and artillery. I’d want them to be as surprising and as threatening to Darguun as to the Five Nations, and present this as an entirely alien form of technology—a path of science others haven’t explored at all. Essentially, in clashing with the Kech Hashrach there would be a chance to explore the conflict between magic and technology. So going back to the player character who wants to be a gunslinger, I’d figure out a way that they could have acquired their tools from the Kech Hashrach. Could they have been a slave who learned the ways of the gun before escaping? Would the player be interested in having ties to the clan—in having somehow earned their respect and been inducted into the Kech? Or might they simply have befriended an old goblin sharpshooter who taught them her secrets? Essentially, I’m fine with a single player character having an exotic weapon, but I’d play up the idea that it IS exotic… and that the Cannith artificer doesn’t get why you’re messing around with dangerous explosives when the basic arcane formulas for pyrotechnic magic are well established and quite safe. If you don’t like the Dhakaani, there’s another path that we’ve mentioned but never fully explored: Elemental weapons. The gnomes of Zilargo are noted for their skill with alchemy and for elemental binding, and we specifically call out that they provided Breland with “elemental weaponry” during the Last War… but we’ve never explained exactly what this is. One possibility is to play up the alchemical side and explore explosive technology. Another is to focus more on the idea of bound elementals; but this would be a way to create a fire-based weapon that’s distinct from a wand. I don’t have time to explore this concept in detail here, but it’s a path that would allow you to create a sidearm or form of artillery that isn’t based on direct spellcasting, while still engaging with in-world lore. And I could certainly imagine interesting ways to make it distinct from mundane firearms. Imagine a form of canon that fires globes containing small fire elementals; when the weapon strikes, it doesn’t just explode, it unleashes the fire elemental in the midst of your enemies. Giving this to the Zil and Breland is also another way to differentiate between nations and to shift the power dynamic from the houses. Aundair might have the finest wandslingers, and House Cannith might be the primary source for arcane weapons of mass destruction. But the Zil could be providing Breland with a form of weaponry none of the other nations use… and the Kech Hashach could be emerging from the depths of Khyber with yet another form of unfamiliar weaponry. So: I personally focus on using magic in place of firearms, but here’s a few alternatives to consider. Have you used firearms in your Eberron? Have you tried out the wandslinger? Share your thoughts below! What class would you use as a wandslinger? Anyone who can cast an offensive arcane cantrip COULD be a wandslinger. It’s largely a question of style. Your wizard can cast fire bolt. Does he take pride in this? Does he carry a fine wand of Fernian ash on his hip, or a battleworn rod over his shoulder? Or is he a scholar who KNOWS the words to produce fire, but prefers only to use them as a last resort? Essentially: does the character use offensive cantrips? If so, do they use an arcane focus more often than not? If so, do they take some pride in this? If so, that character’s a wandslinger. It doesn’t matter if they’re a sorcerer, wizard, warlock, bard, or just anyone who’s taken Magic Initiate. And again, with NPCs they generally aren’t any class at all; the ONLY magic a typical arcaneer knows is the battle magic they channel through their foci. Now, there is something I always wanted to ask Keith ever since he first talked about wandslingers, how common were they in the Last War? And how common are they in post-war Khorvaire? Could you be mugged by a thug with a wand in a dark alley? The short answer is “They’re as rare or as common as you want them to be in your story.” In my Eberron Aundair fielded the first elite arcaneer units in the last 30 years of the war, and they’ve become more common since then. Today I think wand use is common in Aundair, rare in Thrane, and uncommon everywhere else—which is to say, everyone is familiar with the concept of it, people know a wandslinger when they see one, but the city watch are still using crossbows. In my Q’barra campaign, the sheriff uses a bow, but when the slick Tharashk operatives showed up in town, two of them were wandslingers… and again, the innkeeper keeps a rod over the bar. Essentially, wandslinging is definitely new… but sure, you could be mugged by a thug with a wand. But again: in your campaign, it’s as common as you want it to be.